Seinfeld is one of the few things in life that stays as funny as it was. I told some people at a dinner party the other night (they’re Martians, never watched) about the Costco episode, where Kramer buys thirty-five 10 lb. cans of Beef-a-reeno and then has to figure out what to do with it in his tiny New York City apartment. Not to make spoilers, even at this late date, but he feeds some to one of New York City’s long-suffering Central Park carriage horses. Hijinx ensue. I’m a sucker for a good fart joke and so was everybody at the dinner table. Such a good guest am I! My Beef-a-reeno story isn’t half as funny. Absolutely gobsmacked on the price for a five pound bag of spinach, on one of my early, innocent and unguarded tours of Costco, I paid like a dollar for it and considered myself slick. Got it home and realized it would make three gigantic spinach lasagnas, the cost of cheese and other groceries for which approached $100, and which took me like three days including shopping at the other stores, schlepping, parking, chopping, making bechamel, etc.etc. etc.. It was a Trojan horse bargain, like one of those Martha Stewart peasant food recipes — the minestrone from scratch — which cost $100. First catch your cow, and butcher off the shanks…. Strategies for the successful negotiation of Costco include having cleared a place to store the 24-roll whopper-een-o pack of toilet paper. When I lived in an efficiency apartment, I stacked them in a decorative pyramid in a cute galvanized window box in the bathroom. As I had an under-the-counter refrigerator, the three frozen spinach lasagnas would not have fit. Clearing off a shelf in my walk-in closet made space for the one-gallon size of organic dish detergent, and I pretty much still avoid the five-pound bags of carb. What no human can do without from Costco, however, is the jalapeno popper and Amy’s bite-sized quiche hors d’oeuvres. People love them and don’t know you didn’t make them. I tell them I got them at Costco, along with the toilet paper pyramid. I went to Costco the other day and successfully resisted a mouthwatering five-pound bag of pita chips, a half gallon of cashews, three pounds of Brussels sprouts, two quarts of blueberries and so on. I was proud of myself. I cleared space for, and achieved the bargains I needed — extra virgin olive oil, balsamic vinegar, organic canned tomatoes and scored some nummies too — not least half a dozen Comice pears, nowhere else in Macondo to be found, and a side of wild caught, not farmed, salmon, for $8.99 a pound, as compared to $12 or $13 frozen at Albertson’s. But I had to buy a huge slab, nearly three pounds worth, and I decided it would be my meat for the month. How to put it up? Comice pear, the juiciest and most delicious of all, third from right. 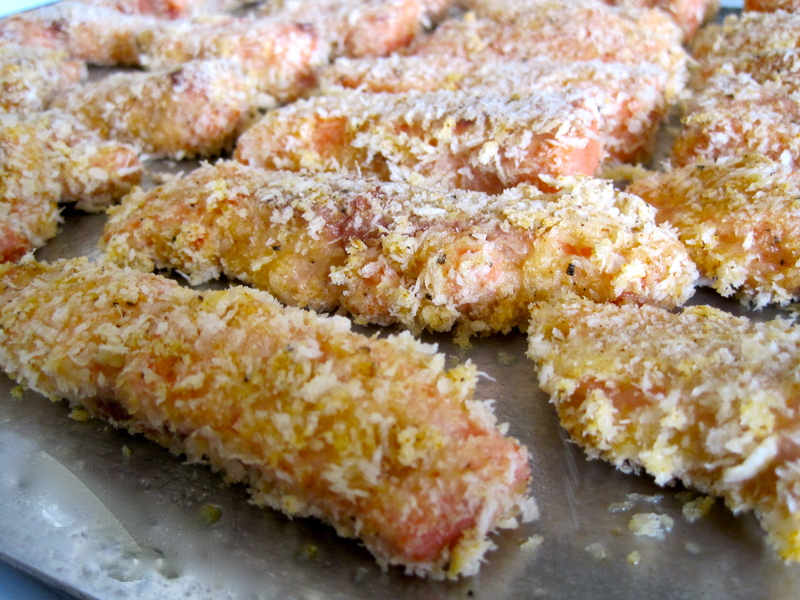 I made fish sticks. I love fish sticks. I want to see how well they freeze. Here’s the recipe I used. Typically for a Costco recipe, I had to go to the hippie-dippie grocery store for cage free eggs to make them; already had panko crumbs from the Asian market. I’m going to have my salmon goujon-a-reenos with that five-pound bag of Costco spinach — ready for it, this time — creamed with an elegant veloute sauce of evaporated milk and chicken bouillion cubes, well-nutmegged, with rice with currants and almonds. The leftovers will be huge and Ima freeze ’em.